What started out as a huge education scoop that shocked parents across the city has turned into a puzzling case. Mayor Marty Walsh and Boston Public Schools have denied that a story on WGBH’s website, at one point headlined “Boston Public Exam Schools May Bar Applications from Parochial, Private, And Charter Schools” is true. The article cited a document that included a proposal to limit access to the selective schools to students who already attend BPS, thereby excluding students who attend school elsewhere, possibly even METCO or charter students. The article’s headline has since been changed, indicating instead that officials are “weighing” the idea. Both Walsh and Superintendent Tommy Chang disputed the original story. Chang refuted the claims shortly after it was published, linking to a draft of the district’s strategic plan posted on the BPS website. BPS also shared a letter from Chang to the community addressing the article. Walsh jumped in shortly after, tweeting that there is “absolutely no truth” to the story. There is absolutely no truth to a @wgbhnews report claiming that @BostonSchools are proposing changes to the admissions to our exam schools. The Boston Public Schools (BPS) does not have a report, in draft or final form, entitled: ‘BPS Strategic Implementation Plan 2016/Opportunity and Achievement Gaps Task Force.’ The article issued by WGBH is false. There are no proposals to prevent any students from enrolling into the district’s three exam schools. BPS is disappointed that the media outlet who reported this erroneous information did not attempt to verify any facts with the school district before posting the article. The strategic plan shared by Chang does not include the language called out in the WGBH story, although it does indicate the district plans to “draft a comprehensive plan to assess and respond to equitable access to and service within BPS’s exam schools” by January 15, 2017. BPS, as the Boston Globe reported earlier this month, has put together an advisory panel to consider ways to make exam schools better reflect the city’s diversity. As Universal Hub points out, a proposal for a similar limit on who can attend exam schools has been on the table before. An “Opportunity and Equity” report from 2014 floated the idea to “restrict exam school enrollment to students who were enrolled in BPS in the fifth grade.” In other words, not private or parochial school students. The proposal never took off. Chang was not yet superintendent at the time. Earlier today, I wrote that Chang was expected to release the plan at Wednesday’s 6 p.m. School Committee Meeting at Dudley Square’s Bruce C. Bolling Municipal Building. He didn’t. Although some members of the exam-school community expected that he would. As a matter of course, the School Committee doesn’t release documents, reports, or written material before its meetings. The school department took strong exception to the above story. It denied, in fact, that the document I wrote about existed. An earlier version of this story had a slightly stronger headline that may have suggested the considered change was a done deal. It is not, or was not. And if Mayor Walsh’s statement is any indication, the recommendations from the supposedly non-existent document I wrote about will never come to pass. In an interview, Kadzis says he corroborated his story with trusted sources and stands by it. Kadzis also says he is exasperated by the response to the article. Kadzis is a master of Boston education scoops, including during this tumultuous year for Boston Latin School. When Mayor Marty Walsh met with BLS teachers after the resignation of headmaster Lynn Mooney Teta, Kadzis tweeted live updates, apparently sent to him from sources inside the room. BREAKING: On going meeting between @marty_walsh and BLS faculty described as “extremely” confrontational. Kadzis, who is a senior editor at WGBH, says he is staying on the beat. 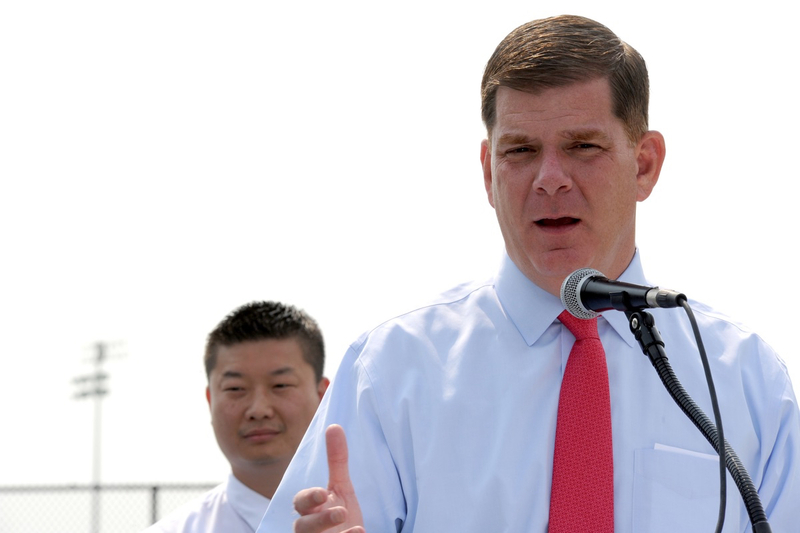 Update July 22, 2:27 p.m. Mayor Marty Walsh addressed the issue again during his regularly scheduled Ask the Mayor segment on WGBH today at noon. He reaffirmed that his administration would not seek an exam school admissions policy that excluded private and parochial school students, saying, “It just wouldn’t be constitutional not to allow them that opportunity.” Responding to questions from hosts Jim Braude and Margery Eagan, he also said he has never seen the document referenced in the story, and that even if the idea had been floated by others in the past, it isn’t on the table now. He also suggested coverage of BLS generally has gotten overheated.